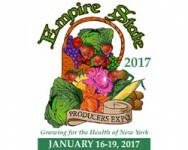 The 2017 Empire State Producers Expo will take place on January 17-19 at the OnCenter Convention Center in Syracuse, NY. This annual show combines the major fruit, flower, vegetable, and direct marketing associations of New York State in order to provide a comprehensive trade show and educational conference for New York producers, as well as neighboring states and Eastern Canada. In years past over 100 presentations were given by Cornell Cooperative Extension personnel and highly regarded speakers from across the country. Panel discussions feature some of the top industry experts and growers in New York. Between educational sessions, attendees can visit the trade show featuring over 150 commercial vendors and non-profit exhibitors. Session topics include commodity specific programs in cabbage, processing vegetables, hops, grains, cut flowers, tree fruit, sweet corn, tomato, onion, potato, Cole crops, root crops and specialty crops; and focused programs in water management and irrigation, weed management, soil health, post-harvest handling, biopesticides, beginning farmer, marketing using social media and apps, transplant and greenhouse production, climate and forecast models, labor, and hard cider production. DEC pesticide recertification credits and Certified Crop Advisor (CCA) credits will be offered during the appropriate educational sessions. The New York Grown and Certified Program will be presented in a special session on January 18 and will feature the Commissioner of Agriculture, Richard Ball. Commissioner Ball will introduce the new standard for New York State agriculture and provide an opportunity for dialog about this new state-wide program. 2017 Becker Forum: Good Agricultural Practices (GAPs)/Produce Safetey Alliance (PSA) Training. The New York State Vegetable Growers Association in conjunction with the Produce Safety Alliance (a collaboration between Cornell University, FDA and USDA) are pleased to announce that one of the first producer trainings to meet the requirements of Food Safety Modernization Act (FSMA) will be offered during the Becker Forum on January 16, 2017 in Liverpool, NY. This 7-hour training will provide the required training for farms to meet the Produce Safety Rule. Berry Grower Protected Culture Workshop on Tuesday, January 17. GAPs Day 2 - Writing Your Own Food Safety Plan Workshop on Tuesday, January 17. The complete Expo program was mailed to Cornell Vegetable Program enrollees. Online preregistration is available from the NYS Vegetable Growers Association.